Translator Wanted: Seoul Selection is looking for a translator with a firm knowledge of economics. For more info, drop an email to atoz@seoulselection.com. 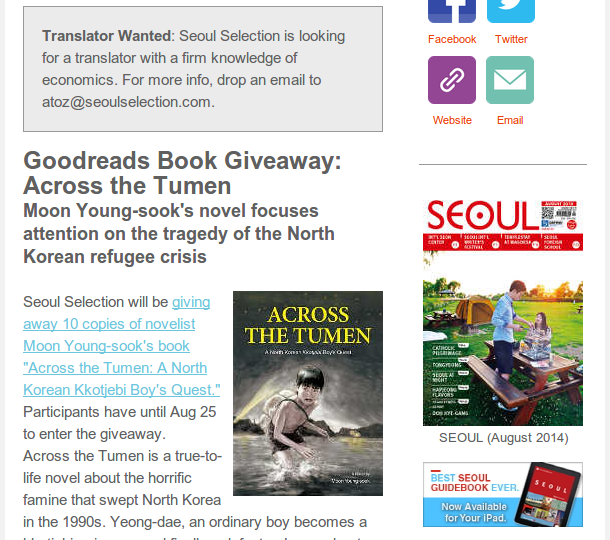 Seoul Selection will be giving away 10 copies of novelist Moon Young-sook’s book “Across the Tumen: A North Korean Kkotjebi Boy’s Quest.” Participants have until Aug 25 to enter the giveaway. Across the Tumen is a true-to-life novel about the horrific famine that swept North Korea in the 1990s. Yeong-dae, an ordinary boy becomes a kkotjebi, prisoner, and finally a defector. Learn about the heartbreaking human rights abuses against North Korean children today. We are pleased to announce the five lucky winners of the Summer Vacation Giveaway Draw. To see who won, follow the link above. Special congratulations to the winners, and many thanks to all who entered. Is Korea the coolest palce on Earth? See Pyongyang as you’ve never seen it before. Pope Francis has peace and martyrs on his mind. Why Korea’s Catholic church is the church of the future. Soju sparks a debate… in New Jersey. Kim Sungjin goes to Dumulmeori. August is myrtle season in Korea. What to do around Gyeongbokgung Station. The beautiful calm before the storm. Seoul’s International Seon Center will host a two-day Templestay program for teens on Saturday and Sunday, Aug 16–17. The program is a good chance for teenagers to find their true selves through chanting, meditation and conversations with monks. The International Seon Center is a Seon (Zen) meditation and Buddhist propagation training center as well as a learning facility for Buddhist cultural practices. The overall aim of the center is to promote awareness of the inherent value of Korean Buddhism and its practices to the global community. GETTING THERE: See this link. Come see the Koreaâs premier musical ensemble before they take off for their European tour. Founded in 1948, the Seoul Philharmonic is one of Koreaâs oldest orchestras, having managed to survive the tragedy of the Korean War. The orchestra made a breakthrough in the international music scene by signing a contract with Deutsche Grammophon in 2011 to produce 10 albums over five years. Its current music director, Myung-whun Chung, became the first Korean to earn a top prize in the International Tchaikovsky Competition in 1974. His conducting career, however, started with the Mannes College of Music and the Julliard School, both in New York City. After working with the likes of the Los Angeles Philharmonic (USA), the Deutsche Radio Philharmonie Saarbrucken Kaiserslautern (Germany) and the Teatro Comunale (Italy) and the Metropolitan Opera (USA), he served as musical director under the legendary Paris Opera from 1989 to 1994, and was named âArtist of the Yearâ in 1991 by the Association of French Theatres and Music Critics. He was awarded the Legion of Honour, a French order established by Napoleon Bonaparte, in 1992 for his contribution to the Paris Opera. In 1995, he was named âMan of the Yearâ by UNESCO. He also made a significant visit to North Korea in 2011, returning with a promise to eventually form an orchestra with musicians from both Koreas. Pianist Ju-hee Lim has been playing the piano since she was three years old. Her professional career began only six years later, in 2009, when she played at the Yamaha Little Pianist Series. She has since developed an illustrious list of accomplishments, as well as performing in such places as China, Germany, France and Russia—quite a feat for a 14-year-old. A promising upcoming talent paired with a legendary veteran: the resulting show is sure to be a treat. âThe Masterpiecesâ is an exhibition that takes the very best and the most memorable pieces from the Museum of Photographyâs vast collection and displays them in an organized and retrospective fashion. See moments captured by the likes of Eugene Atget, Edward Steichen and Yousuf Karsh, among others. The Museum of Photography was established in 2004 to expand Koreaâs presence in the international photography scene, as well as to enlighten the public regarding the complexity and artistic value that photographs hold. The museum is also a place for people to come and be inspired to take better photos themselves. Moreover, the institution aims to discover hidden talent in Korea and promote the countryâs local artists to the rest of the world. Given that photography is still a relatively underdeveloped discipline in Korea, itâs important for Korean photographers to retain a sense of identity and uniqueness without being swayed too much by global trends or succumbing too much to Western influence. This goal is something that cannot be accomplished by photographers alone; they need the support of an active community and consistent exhibitions that both promote existing work while nurturing the creativity of future artists. âThe Masterpiecesâ is one of such initiatives, an exhibition to ignite the creative minds of those who visit. Spend your Saturday outside of Seoul, enjoying the green countryside and relaxing atmosphere of the area around Cheongpyeong Lake. Today’s excursion will be quite leisurely, and offers a choice of activities; the RAS therefore recommends this as an excursion for the whole family. Bukchon on a rainy summer day. Photographed by Robert Koehler. Seoul Selection’s Free Book Giveaway – Our free book give-away continues! Check out the list in last week’s newsletter here. Looking for Translators – Seoul Selection is looking for a few good translators (Korean to English) for general translation work. Those interested should send a resume and cover letter to Kyehyun at atoz@seoulselection.com. Experienced translators only. Send Your Event Info – If you would like to advertise any upcoming events you are organizing, please send us the press release material at pubco@seoulselection.com by the preceding Friday in order for it to appear in the following Tuesday’s issue. 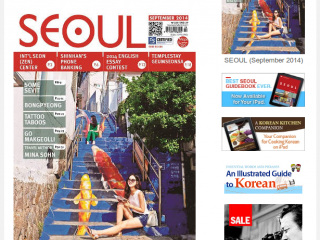 Freelance Contributors Wanted – SEOUL Magazine needs writers who are fluent in both Korean and English. Writers should have a strong interest in Korean culture and be able to interview Koreans. Send your resume and writing samples to english@seoulselection.com.